Students: M.B.B.S, nursing, and allied health science students. During the study period, a total of 54,562 patients presented to the ED with various complaints. A total of 956 staff and students comprised 2.8% (1528/54,562) of all the emergency visits. There were 1350 staff visits and 178 student visits during the 1-year study period. There was a clear female predominance (68.1%). Majority were in the 16–35 years' age group. The baseline characteristics are shown in [Table 1]. The disease profile and the main departments involved are shown in [Table 2]. More than half (57.5%) had general medical complaints and only required pharmacological therapy. A quarter of the staff and students (25.5%) presented to the ED with trauma with more than half of those being road traffic accidents [Table 3]. 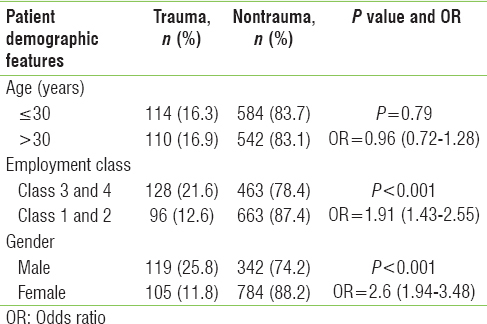 Univariate analysis for risk factors for trauma among staff is shown in [Table 4]. Class 3 and 4 employees had a higher incidence of trauma (21.6% vs. 12.6%, P < 0.001; odds ratio [OR] = 1.91 [95% confidence interval (CI): 1.43–2.55]) as also males (25.8% vs. 11.8%; P < 0.001; OR = 2.6 [95% CI: 1.94–3.48]). The two variables were analyzed on multivariate logistic regression analysis with class 3 and 4 employees having a statistically significant adjusted OR of 238 (95% CI: 1.65–3.42) and males having an OR of 1.16 (95% CI: 0.81–1.67). 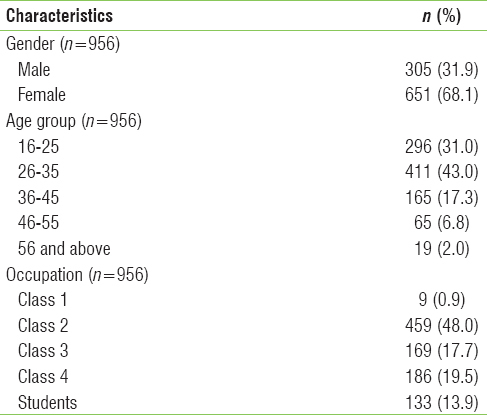 The risk factors for trauma among MBBS, nursing, and allied health science students are shown in [Table 5]. Joseph B, Joseph M. The health of the healthcare workers. Indian J Occup Environ Med 2016;20:71-2. Rugless MJ, Taylor DM. Sick leave in the emergency department: Staff attitudes and the impact of job designation and psychosocial work conditions. Emerg Med Australas 2011;23:39-45. Steenstra IA, Koopman FS, Knol DL, Kat E, Bongers PM, de Vet HC, et al. Prognostic factors for duration of sick leave due to low-back pain in dutch health care professionals. J Occup Rehabil 2005;15:591-605. Peterson U, Bergström G, Demerouti E, Gustavsson P, Asberg M, Nygren A, et al. Burnout levels and self-rated health prospectively predict future long-term sickness absence: A study among female health professionals. J Occup Environ Med 2011;53:788-93. Cáceres VM, Kim DK, Bresee JS, Horan J, Noel JS, Ando T, et al. A viral gastroenteritis outbreak associated with person-to-person spread among hospital staff. Infect Control Hosp Epidemiol 1998;19:162-7. Vardy J, Love AJ, Dignon N. Outbreak of acute gastroenteritis among emergency department staff. Emerg Med J 2007;24:699-702. Marnejon T, Gemmel D, Mulhern K. Patterns of needlestick and sharps injuries among training residents. JAMA Intern Med 2016;176:251-2.